I set out in late February for a six-day desert road trip. With so much time available, I was aiming further afield than usual, a collection of desert peaks found between the Mojave National Preserve and Death Valley, north of Interstate 15 and near the CA/NV border. The more obvious peaks such as Clark and Kingston I had already climbed as part of the DPS list. This trip would focus on some of the more obscure summits found in Wheelock's and Zdon's peak guides, a couple of Wilderness highpoints, and other neighboring summits found in no guidebooks and making no lists. I had taken my daughter to the San Jose airport for an early flight to a volleyball tournament in Denver, allowing me a pre-rush hour exit from the Bay Area and on my way across the state. I would spend much of the next seven hours driving to the Halloran Springs exit and then north on a badly eroding stretch of pavement for about six miles. The road leads to the communication towers atop Turquoise Mtn, one of three summits described in both of the aforementioned guidebooks. I had been to Turquoise but not the other two and it was this pair I was seeking out today. All three are minor summits around Bull Springs Wash, not part of any larger range or hills in the higher expanse of desert terrain NE of Baker. With a high clearance vehicle one can drive much closer to these summits as Zdon nicely describes, but I would be making a longer excursion of it starting from the pavement and covering almost 12mi. It was already 1p before I was able to get started and I wasn't all that sure that I could reach both peaks before darkness set in. I had parked at a junction with a road heading east towards Squaw, figuring I'd use that to get myself most of the way to Squaw Mtn. As it turns out, the road isn't all that necessary as the cross-country travel in this part of the desert is fairly easy. Nevertheless I used the road to cover the first 2.5mi, bringing me to the base of the mountain, southwest of the summit. Leaving the road, I followed a wash around the east side of nearby Peak 4,678ft, then climbed Squaw from the west. Not a particularly high mountain, the climb was only about 500ft from its base and it took only an hour and a quarter from the start in order to reach the summit. While not very high, the peak's isolation provides a 360 degree view covering hundreds of square miles. Notable peaks include Kingston to the north, Clark to the east, Solomons Knob to the south and Turquoise to the west. A MacLeod/Lilley register dates to 1978, containing but nine sparsely populated pages with about half of the names recognizable as the usual suspects. More confident now that I would get back by sundown, I set off for Solomons Knob about 3.5mi to the SSE. I dropped directly down the south side of Squaw before correcting my course to Solomons Knob when I was on the desert floor. 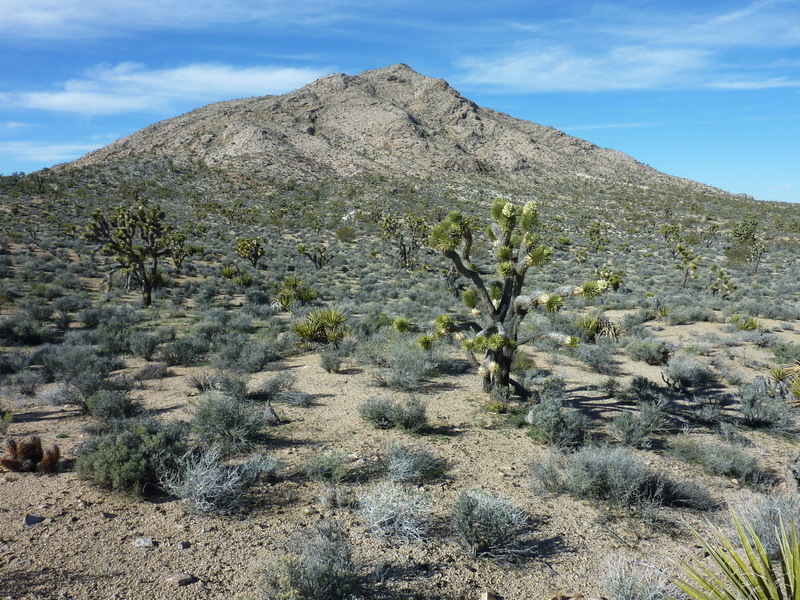 Scattered joshua trees enhance the desert scene of sparsely populated scrub atop a sandy floor. The ground here isn't quite flat, dropping about 400ft over several miles to Bull Spring Wash before starting to rise again. Volcanic Solomons Knob is distinguished by a double band of cliffs on its upper north side. To add some challenge I picked out a line directly up this cliff band where a weakness allows for some class 3 scrambling, although only a few minutes' worth. Another MacLeod/Lilley register was found at the summit, placed some 26yrs after the one on Squaw - that's a long time to travel three and half miles. The seven pages of entries suggest it sees about one visit per year. It was just past 3:30p and I was about 4.5mi from the car, giving me plenty of time to get back. This was going much faster and smoother than I had expected.